Western Lowland Gorillas The Western Lowland Gorilla (Gorilla Gorilla Gorilla) belongs to the family ‘Pongidae’, which includes four species of great apes: the Gorilla, Common Chimpanzee, Bonobo or Pygmy Chimpanzee and Orangutan. The Western Lowland Gorilla lives in the tropical rainforests spread across six countries across west equatorial Africa which include: southeast Nigeria, Gabon, Cameroon, Central African Republic, Congo and Equatorial Guinea. The Western Lowland Gorilla is the largest of all primates. Western Lowland Gorillas have broad shoulders, a muscular neck and strong hands and feet. 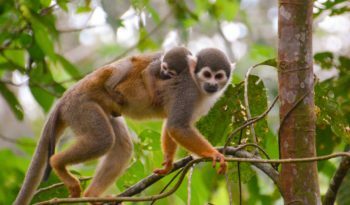 Their considerable size gives them a good defence against predators and they live in relative safety on the ground, more so than any other primate. The Western Lowland Gorillas body is covered by short, thin grey-black or brown-black hair. A gorillas face has no hair, however, they do have a thick ridge above their eyes. 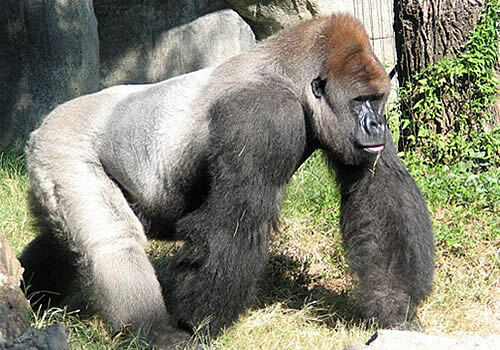 A mature male Western Lowland Gorilla has silver fur on its back. These adult gorillas are called ‘Silverbacks’. Western Lowland Gorillas can walk for short distances on two legs however, they generally get around by walking on all fours. When doing this, they walk on their knuckles which is known as ‘knuckle-walking’. 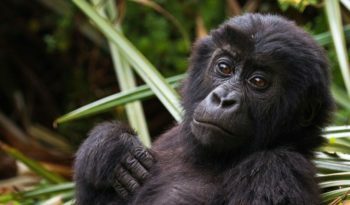 Western Lowland Gorillas are omnivores, however, they are sometimes classed as herbivores because they mostly eat plants. They survive primarily on fruit, leaves and foliage. Western Lowland Gorillas sometimes do eat insects such as termites and ants to supplement their diets. Western Lowland Gorillas do not drink water as they get adequate moisture from the foilage they consume. The only predators to the Western Lowland Gorilla are leopards and human beings. Western Lowland Gorillas form small, non-territorial harems usually dominated by a single, mature male gorilla. They live in structured family groups. A group will consist of one adult silverback gorilla, several unrelated female gorillas and infant gorillas. 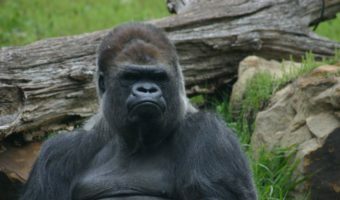 The silverback gorilla is the dominant gorilla in the family and he regulates the schedule of his group. Western Lowland Gorillas will spend several hours of the morning eating, take a break in the middle of the day and then eat again before nightfall. During the mid-day break, young gorillas play with each other while the adults sleep. While Western Lowland Gorillas are social creatures and need other gorillas around to survive, the only very strong bond they form is the bond between a male gorilla and its female gorilla mates. Western Lowland Gorillas are quiet, shy, non-aggressive animals. There is very little conflict between groups that have overlapping territories, although when threatened, the male gorilla does everything it can to scare off the predator or trespasser. Adult Western Lowland Gorillas perform elaborate displays, including chest beating, running sideways and tearing up vegetation to frighten off an intruding male or other threat. Male Western Lowland Gorillas also use these displays as a show of dominance within the group. Adult female gorillas can become aggressive when defending their infants, or while helping each other drive off rowdy, young adult male gorillas. The silverback is the peace keeper and intervenes between occasional squabbles between female gorillas. Western Lowland Gorillas build a nest every night out of plant material to sleep in and a day nest for their midday rest. Western Lowland Gorillas sexually mature in the wild between the ages of 7 to 8 and in captivity approximately 5 and a half years old. Male Western Lowland Gorillas sexually mature in the wild between 8 to 9 years old and in captivity as early as 6 years old. Males are not considered fully mature until about 15 years old. Western Lowland Gorillas do not have a distinct breeding season. Gestation lasts from 250 to 270 days (8 – 9 months). In the wild, female gorillas usually deliver their first offspring at 10 – 11 years old and at 4year intervals thereafter. One infant gorilla is normally produced and twins are rare. Birth occurs with the female gorilla in supine position, over the course of a few minutes. After the baby gorilla is delivered, the mother gorilla severs the umbilical cord. The offspring are born helpless and must be carried in the mothers arms. At birth, infant gorillas weigh 4 – 5 pounds (1.8 – 2.3 kilograms) and have sparse hair covering their pink-grey skin. The mother gorilla holds her newborn infant belly-to-belly for close contact until it develops the strength and coordination to cling onto her hair at about 2 months. The huge silverback is a patient father who will play with the infant once it becomes mobile. At about nine to 10 weeks, infant gorillas begin to crawl on their own and soon walk on all four limbs. A white patch of hair appears on their rumps at about the same time they begin to walk. The white patch helps the mother keep track of the infant and assists other group members in identifying the gorilla as an infant. The rump patch begins to disappear at about age 3, the same age that weaning usually begins. Females remain with their natal group until about age 8 or 9, then join an unrelated group or a solitary male. Males remain with their natal group until about age 12, then begin to go off on their own. Solitary males try to attract females from other groups to form their own group. The frequency and duration of sexual activity in gorillas are low in comparison to other great apes. Only the silverback, or dominant male, is allowed to mate with the adult females in his group. The reproductive success of males depends upon the maintenance of exclusive rights to adult females, which is ensured by males forming a permanent bond with each female in a social group. The formation of these bonds keeps adult females from leaving the group or mating with other males. Normally quiet animals, gorillas are unusually loud during copulation (mating). Life span: Western Lowland Gorillas live 30 to 40 years in the wild, 40 to 60 years in captivity. In the wild: A gorillas diet is similar to that of the chimpanzee, however, these gorillas eat larger fruits and mature leaves and stems. The gorillas diet includes parts of at least 97 plant species, as well as invertebrates, such as termites and ants. About 67% of their diet is fruit, 17% is seeds, leaves, stems and pith. 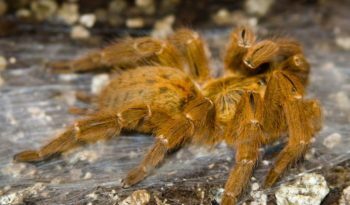 Animal prey, including termites, caterpillars, and other insect larvae make up the rest. Western Lowland Gorillas eat fruits during the wet season and more herbs and bark in the dry season. They seem to prefer sugary fruits and pith, as well as protein-rich leaves and bark. 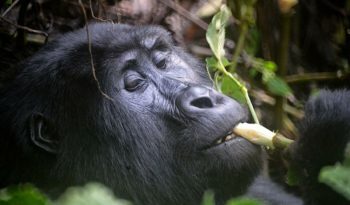 Like other apes, gorillas feed on seasonal fruits and disperse seeds in their dung as they travel from place to place. The male gorillas range further in the wet season in search of fruit and spend more time on the ground eating herbs in the dry season. Female gorillas feed higher in the trees and eat more leaves than males. At the zoo: Gorillas eat vegetables, fruits, leaf eater biscuits, browse (cut branches from a variety of trees, herbaceous plants, alfalfa, ferns, clover), non-fat milk and yogurt and a vitamin and mineral supplement. Gorillas in captivity tend to eat less bulk food than those in the wild. Adult male gorillas eat about 60 – 70 pounds of food per day. Adult female gorillas eat about two thirds of that amount. Gorillas can make up to 25 vocalizations such as grunts, laughs, hoots, barks and screams, each with its own specific meaning. Western Lowland Gorillas have no known enemies except humans. Humans have threatened their livelihood for over a century and have caused them to become endangered through the degradation of the tropical rainforest, illegal hunting for meat, big game hunting, sale of live young gorillas and over-collection by zoos and research institutions. Many gorillas have been shot and killed in the name of self-defense because if provoked long enough, gorillas will charge toward an attacker in order to scare them away. However, they charge to intimidate, not to injure and rarely make actual contact with one another under these circumstances. Their last chance for survival may be a few gorilla sanctuaries in Africa, zoos and other captive environments in other parts of the world. Western Lowland Gorillas are found in zoos all over the world. 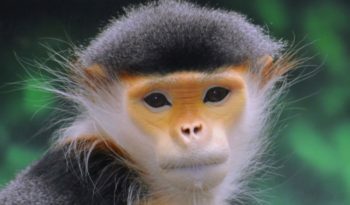 They have been important in behavioural research because their intelligence and body structure are closer to that of humans than any other primate except for chimpanzees. Western Lowland Gorillas are very intelligent and have even been taught sign language. They are quite capable of doing complex tasks. News: Wednesday 12th September 2007: The Western Lowland Gorilla has now moved from being endangered to critically endangered. This is due to human alteration and loss of habitat. Gorillas, orangutans and corals are among the plants and animals which are sliding closer to extinction. The Red List of Threatened Species for 2007 names habitat loss, hunting and climate change among the causes. The World Conservation Union (IUCN) has identified more than 16,000 species threatened with extinction.